Discover the most important augmented and virtual reality news and product launches in October 2018. We started this October with the hope that there will be exciting developments to talk about in this roundup article. And we were not disappointed. First of all, a major AR and VR technology event saw its third anniversary on European territory. Second, important changes took place in one of the leading companies in the AR/VR world. And they promise to have long term consequences. While some of these changes will disappoint a part of the company’s customers, others promise to enhance the way users experience AR/VR apps and games. The adoption rate of augmented and virtual reality technology speeds up in many industries. This month brought forth an important announcement in this respect from a major university. Moving on to the world of gaming, one of the most popular AR games on the market got a significant improvement. We are also talking of improvements in one of the best sold headset brands on the market. Let’s now go into detail with the top news and events in the AR/VR world for October 2018. The third European edition of AWE took place in Munich, Germany, on October 18-19. This year’s edition had 100 featured speakers and 100 exhibitors. The key topic of the event was the current and potential uses of AR in various industries, with practical examples from Boeing and Bosch. Elise Xu – Product Manager of Augmented Reality Publishing, Facebook. Vuzix – for the category Best in Show Overall. Oculus Rift owners won’t be able to rent or purchase VR videos in the Oculus store anymore. The Facebook subsidiary has decided to shut down the Video on Demand feature. They will, however, reimburse all users who have already made purchases. Oculus users can still access their purchased videos until November 20. After this date, no video titles will be available in the Oculus store any longer. This decision comes amid significant changes at top management level. The CEO of Oculus, Brendan Iribe, has left the company. At the same time, there are rumors that the plans for developing the second generation of Oculus Rift headset are canceled. Queen’s University in Canada has formed a partnership with SimforHealth and HTC to develop a virtual reality training center for medical students. SimforHealth is a European company specializing in developing VR software and will create a full range of training programs for future doctors. The students will use HTC VIVE headsets to step into the VR world where they would have to, for example, respond to emergency situations or conduct routine consultations with patients. The VR training center should open in January 2019. Niantic is working on an innovative augmented reality cloud platform. They have already made the first step in embedding it into its products. The company will add the ability to track steps in the background to its most popular game to date, Pokémon GO. This new feature will allow players to collect rewards and upgrade their characters without having the game actively running on their smartphones. The persistent content feature enabled by the cloud AR platform will track the users in their natural environment and collect Pokémon GO rewards whenever the user passes by them. The new feature is called Adventure Sync and can even connect to iOS and Android fitness apps, recording the steps taken and burned calories. Niantic will also incorporate Adventure Sync into two of its upcoming AR games- Ingress Prime and Harry Potter: Wizards Unite. It seems that October was a very busy month for Facebook’s virtual reality subsidiary. Apart from management and strategy changes, Oculus also filed a patent with the United States Patents and Trademark Office. The document describes a wireless relay system whose purpose is to prevent signal loss when VR headset wearers step away from the range of the primary transmitter and receiver. The relay would operate in a similar manner to a WiFi range extender, using the 60 GHz transmission frequency. However, the patent document does not seem to focus on securing the IP rights for the full system, but only for the continuous calibration process that reduces interferences. There is no telling whether the company will actually develop this type of relay. 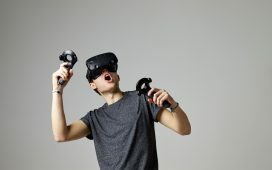 Like other large companies, Facebook – and its VR division Oculus – also file a large number of patents for the sheer protection they can obtain over potential emerging technologies. The high end model of HTC VIVE virtual reality headset will have a special bonus for users: finger tracking. This new feature will be available via the Viveport SDK to all registered developers who want to add it to their VR apps and games. The innovative feature will be enabled by HTC VIVE Pro’s camera setup, consisting of 2 outward facing cameras. At the present time there is no teaser or video demonstration for the finger tracking ability of the device. There are still questions regarding accuracy, latency and field of view. However, this first step forward is an important one in making VR experiences more interactive and engaging.